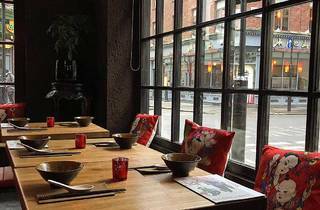 A Chinese street-food restaurant in Soho. 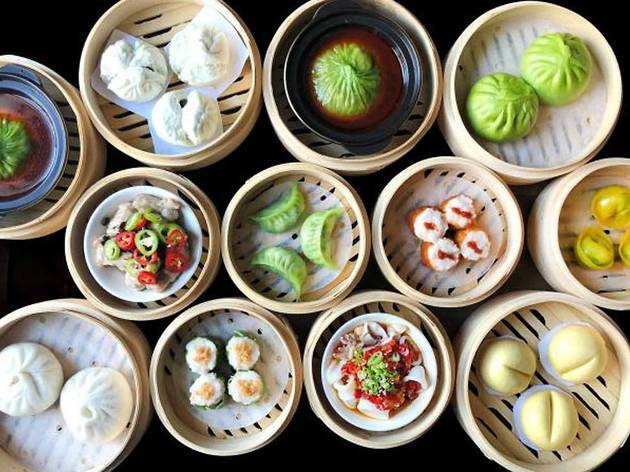 It’s all about the buns at BaoziInn (all one word; their spelling, not ours). Specifically, the barbecue pork buns. 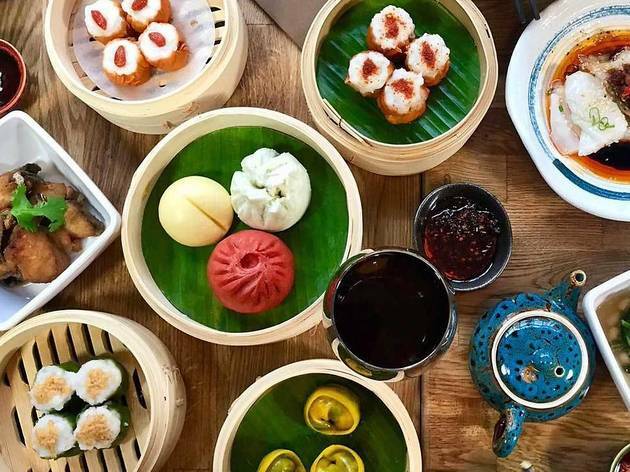 At this basement Chinese street-food restaurant, the emphasis is on bao(zi), and the buns were as they should be: soft and fluffy on the outside; deliciously warm, sweet and sticky on the inside. 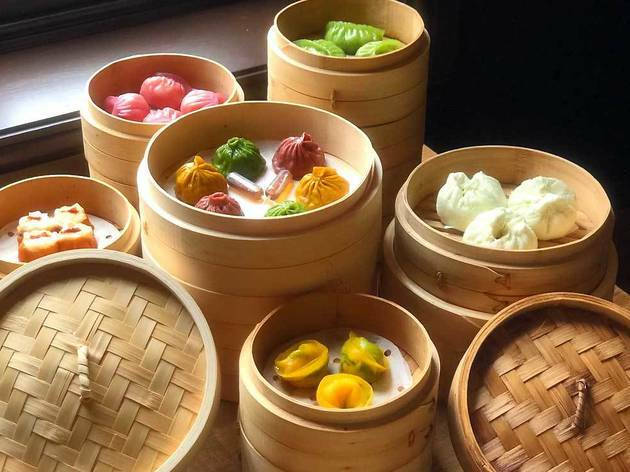 Other highlights: a chilli pork steamed bun made of bright pink beetroot juice dough, which had just the right amount of heat, and the Chinese vegetable bun made of green spinach dough, which was a refreshing veggie option. Some light and crispy vegetable jiaozi (regular dumplings), dipped in salty soy sauce, also got the thumbs up. 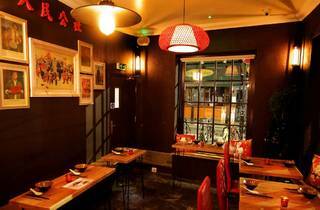 The intimate ambience at this Romilly Street branch of BaoziInn (not to be confused with its much busier Chinatown cousin on Newport Court) makes it a good choice for a romantic dinner. 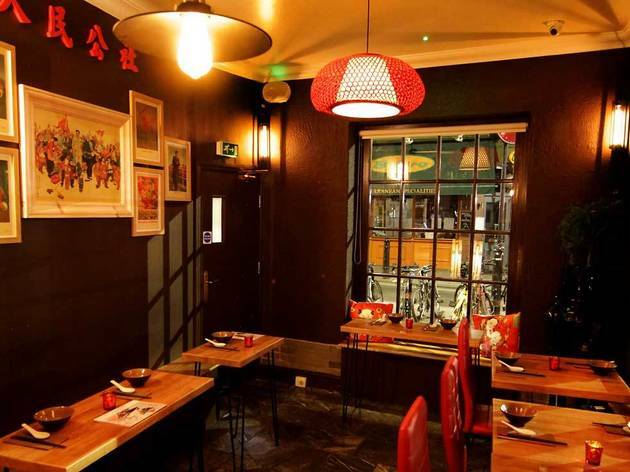 Upstairs and downstairs are both dark and cosy, disguising any imperfect chopstick skills and blocking out the noise of Covent Garden, and on my visit, smooth, old-school Sinatra was playing over the sound system. If you’re dining in a group, make a beeline for the six-seater table that’s in a private nook – it’s by far the best spot in the house. 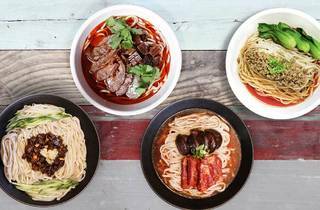 Other dishes – beef spare ribs, mushroom noodles in broth, black sesame cake – were all fine, but not great, which is a shame because I get the feeling the kitchen is trying to branch out. 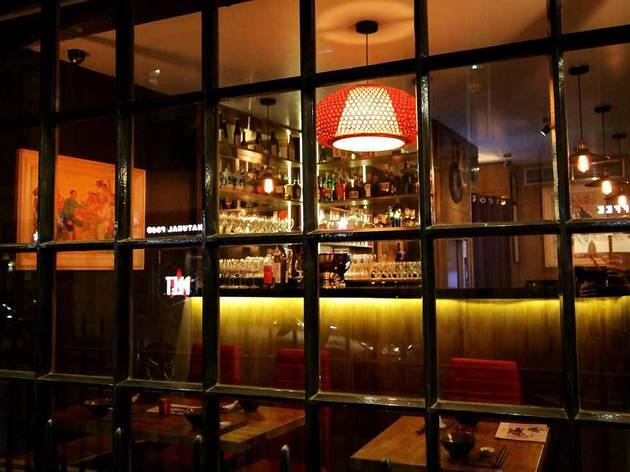 Take a date for pre-theatre beers and bao, and you’ll do very well here. Repeat: it’s all about the buns. 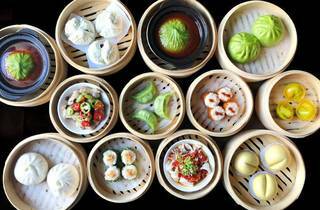 Baozilnn, an 80-cover restaurant serving authentic, well-priced Northern Chinese street food, and the first in London to offer all-day Cantonese Dim Sum with Sichuan and Hunan influences. Our star dishes include Prawn and pork wontons, Chengdu jiaozi dumplings drenched in the best quality XO Sauce, incredible handmade Dan dan noodles swimming in house-made combination of soy sauce, sesame sauce, peanut sauce, and minced pork, Fried prawn brioche, Crispy oyster mushrooms, Salt and pepper squid, Jiaozi in hot and sour broth; Sea bream in Chef’s XO sauce and Red braised pork belly. 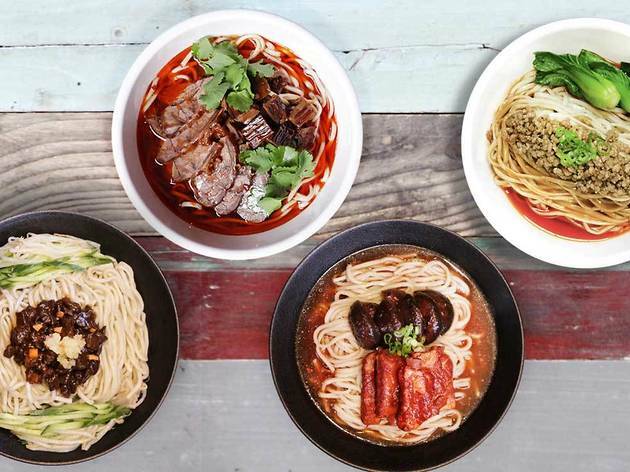 The Baozilnn menu features a range of regional Northern Chinese favourites – hearty, comforting, affordable, yet adventurous Baozilnn -人民公社, meaning “people’s canteen” has been brought to you by Barshu group, which, twelve years ago, caused a sensation on the London restaurant scene by opening Barshu Restaurant, a real game changer responsible for putting Sichuan food firmly on this city’s culinary map. 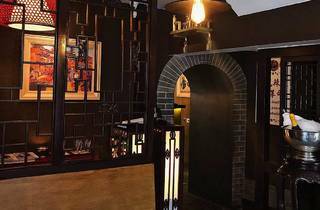 Based in a converted corner town house, the restaurant is arranged over three floors and divided into five distinct dining spaces. Large Georgian sash windows flood the ground floor with light. 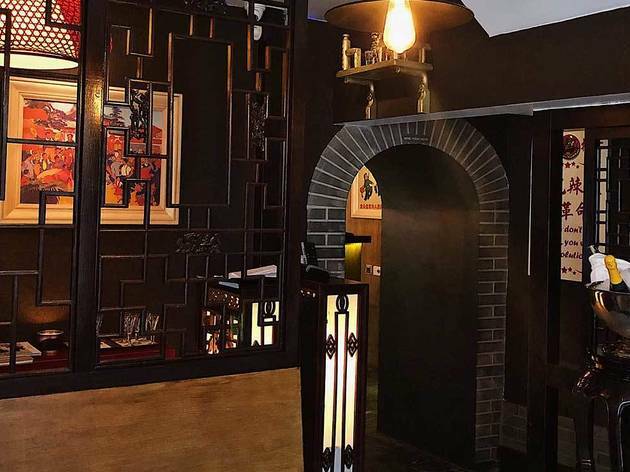 Each room combines traditional elements, such as Chairman Mao-themed artwork, Asian lanterns and decorative shutters, with contemporary touches ¬– sleek slate floors, exposed brickwork, aubergine coloured walls, light oak wood tables and benches and bright red upholstered leather dining chairs. 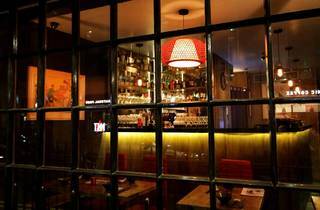 Dinner and drinks for two with service: around £60. 1. 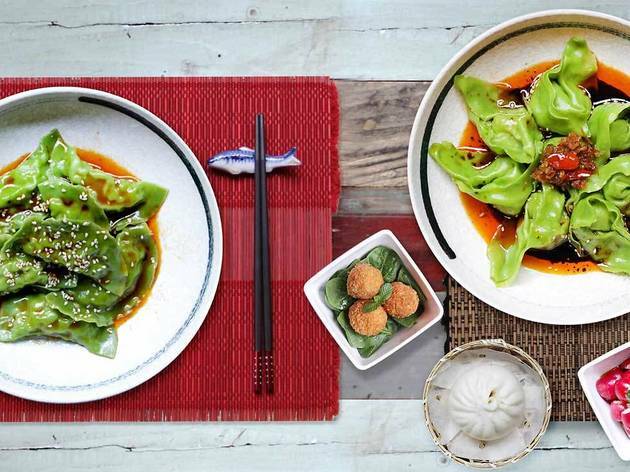 Traditional JiaoZi Dumplings (Pork) - My favourite dish that we ordered because they were had a great pork filling. There was even a little soup in some of them, so super moist. The dumpling dough wasn't too thick and it was served in a simple way, with vinegar on the side. 2. 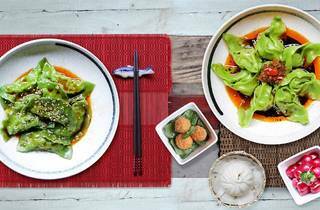 Sichuan Pepper Pork & Prawn 'Shao Mai' - A pretty spicy steamed dumpling! Not one that I've tried before but a tasty bite! 3. Prawn & Chive Dumpling - A classic combination and I really liked how there were whole prawns on the inside! 4. Dan Dan Noodles - A real treat! It was super spicy and included the peppercorns that numb your tongue/lips! It was super flavourful because the sauce had a peanut taste, it was thick, and the mince pork was generous. The noodles were so fresh as well! 5. Salt & Pepper Squid - We opted for this as a 'starter', which was done well. The batter on the squid wasn't too thick, the squid itself wasn't too rubbery, and it also came stir-fried with some vegetables. Overall, the service was quick and efficient. However, our waitress kept coming around to clear our plates when we weren't done and even offered the bill before we were ready to leave. Almost a bit rude but it was a quick and easy meal. I'm Chinese and I would highly recommend the food here. Ignore the service - for most Chinese people restaurant is just a place for food not a place for service. Also this is not szechuan cuisine - it's more like Hunan, which is also hot and spicy, but without too much peppercorn. If you can't stand hot and spicy food, i doubt there's anything good on the menu. But if you do love hot and spicy food, like me, I'm sure you'll love this place! The food was absolutely wonderful. Especially for the Dumplings hand made it just delicious....highly recommend! Had a really good family meal here, the portions were very generous and the service was excellent. Loads of great dishes kept on coming, we could probably have ordered about half the food and still been happy! Ba Shan Restaurant served very authentic Chinese food I had tried other Chinese restaurant in Chinatown nothing beats Ba Shan Restaurant in terms of flavour, and authenticity of the food. I loved the seabass fish served with rice noodles taste sweet and succulent. Had ordered the Cumin lamb a must try! I still love the stir fried Cabbage with soy sauce, and a tinge of spicyness of red pepper. This cabbage is no doubt simple can only be done perfectly with an experience chef, only a few simple ingredients yet the taste can be so memorable. A must try is the duck tongue hot spicy Szechuan pepper, flavourful served piping hot in a warmed wok. Overall I'm impressed with the food, the service is courteous, the manager and staff respond to your orders efficiently. Very disappointed. Staff was really grumpy and rude, and tried to charge us for tea we did not drink. The manager got quite agressive when we would not pay. Also some of my friends, who shared the same dish, are suffering from what seems to be food poisoning a day later. Not going there ever again. 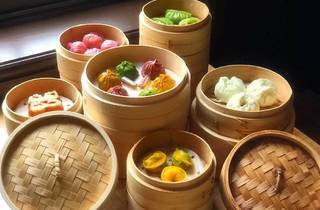 Delicious and very authentic Chinese food. Mostly spicy so not for those who don't like it hot. I have just returned home after 24 years in China and this is the only restaurant in Chinatown we've found that tastes like the food in China. Finally I've found this place! This is the best Chinese food I've had outside of China! 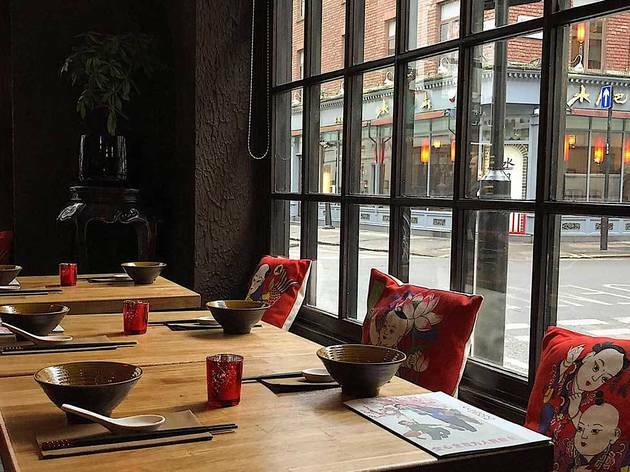 Proper authentic dishes in a very Chinese setting. The diners were mainly Chinese, however the staff were friendly and accomodating (when I asked for a customised version of a dish). 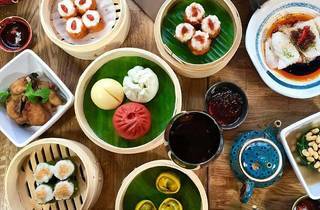 It looks expensive, but if you eat as you would in China (buy a few dishes to share) then it works out less than £20 a head. Completely different to the 'sweety-sticky-samey' stuff you get in Chinatown. Went to Ba Shan and had an absolutely amazing meal last night. I don't think I've had Chinese food as good anywhere outside of China. It was fairly spicy, as could be predicted and the service is standard. Anyone not into good, spicy Chinese food or basic service should look elsewhere. Having said that, I don't think I've had warm cuddly service at ANY Chinese restaurant anywhere in the world, so those who complain about service are perhaps just expecting a different standard. Standout dishes were Ma Po Doufu, Yu Xiang Qie Zie, cumin spare ribs, and dry-fried green beans. Will definitely be back! Best Chinese food I've had in the UK. The service was fine and quick but the food is the real star here. It's hot, it's spicy and I hadn't seen many of the dishes on other Chinese menus in the UK before. Don't expect western style comfort or service, this is a whole other experience. Will definitely return. We had dinner at Ba Shan last night and after reading all the reviews about terrible service, we were very pleasantly surprised! We were greeted in a very friendly manner and immediately seated, were able to order when we wanted to and the food all arrived in good time. We also got a very happy response when we asked to box up the food that we had over-ordered! 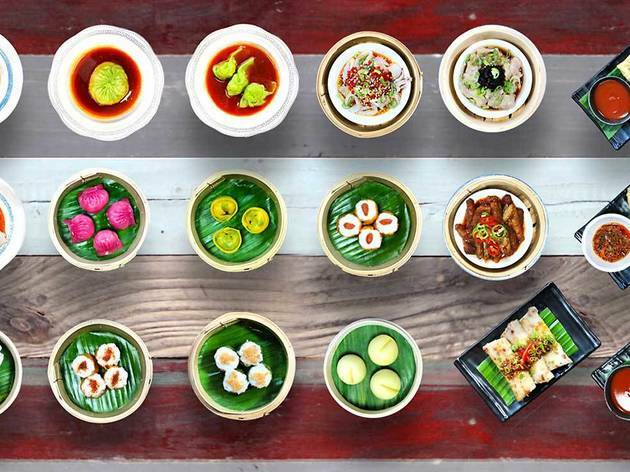 Particular highlights were the Pock-marked old lady bean curd, the fish fragrant aubergine and the smacked cucumber. Delicious, all of them. 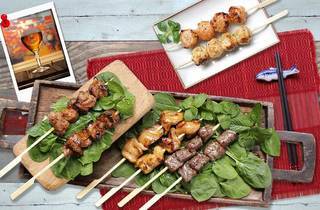 We'll be going back and taking reinforcements so we can try some more dishes! Ba Shan disappointment. Having looked at several review sites, this place got generally high scores. We ate here yesterday. We love spicy hot food. The interior is well, ok. The hard chairs would make your nether regions go numb after an hour. We shared chicken strips and noodles in a spicy chilli oil dressing (£7.50), and it was delightfully hot and crunchy. I ordered deep fried king prawns (£17), and my wife shredded lamd with chilli, ginger and spring onions (£11). We had 2 Chinese beers (£7.00), and rice for two (£3.60). Our bill was £50 inc service charge. The king prawns were ok - prawns in batter with a slightly spicy sauce. The lamb dish was pretty tasteless and boring. The bill was not itemised, which always gives you the feeling that they are ripping you off. Frankly, our local chinese takeaway would compete evenly on food quality for Ba Shan, and at a fraction of the price. 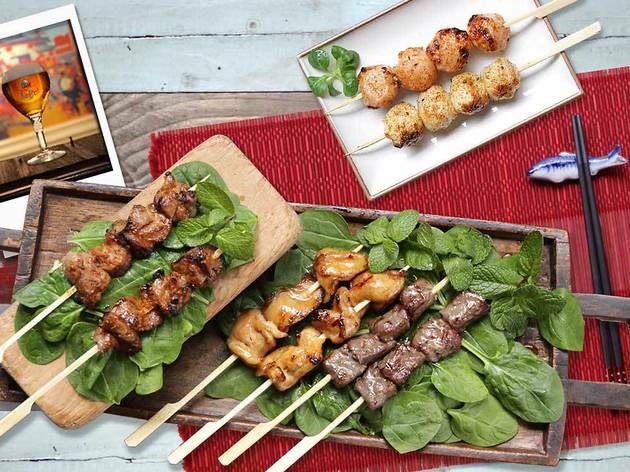 The foodie reviewers clearly had a bad day when they rated this very average establishment. Such a shame as most of the food was lovely when it eventually came. The manager was incredibly rude - we were a large party and a couple of people were ill. As it became apparent there were two spaces he came marching downstairs to shout at us that we had ruined his service as he could have used more tables (the place was empty). In order to stay we had to promise that we would leave in two hours. After two minutes of finally sitting down we were being pressed for our order and told to hurry. The food comes as it is cooked which is fine normally but the rice was served after a lot of the courses had already come out. Many of our orders were wrong but we were so concerned over time we took them as they were thrown at us. We had one lovely waitress who was clearly embarressed but everyone else was just plain rude. The whole time we were looking at our watches and made sure we were ready to leave after a couple of hours. At which point they were trying to encourage more drinking - we looked upstairs and it was empty so they were keen to keep us spending hence the change in tune. When the bill came they wouldn't give us an itemised bill - at which point we were exhausted with arguing over our dinner we gave up. They had clearly overcharged and neglected to take off the food that was never delivered to the table. I'm not one for fussy service - all I ask is that you are made to feel a little welcome - just a smile is fine. This was a horrible night, overpriced (a plate of steamed greens was £8.90 - and that is all they were) and we all felt pretty miserable when we left. Some of the food was lovely though, it is 'authentic' as I used to eat in China, however there are several places within spitting distance that are cheaper, and you may even get a smile. You have been warned! Sat there for fifteen minutes. Nobody came to ask what I might like to eat or drink. I left. An oasis of hot meaty things and "slippery wood ear fungus". Oh, and really nice wine. The rudeness of the staff was only matched by the rudeness of the manager. We went as a group of four, one of us was a vegan and discovered that there was nothing on the menu she could eat. The rest of us placed our order. We were then informed by the waiter than our order should come to a minimum of GBP 10 per person. While this annoyed us slightly, we ordered some more food anyway. We were then told that it still didn't come to GBP 10 per person because there were 4 of us and so the total bill should be GBP40. We explained that one of us wasn't eating because she's a vegan. The waiter was rude and said that it was the restaurant policy, if four people have booked a table, the minimum bill must be 40 pounds. I asked to speak with the manager and explained to him our situation. I was then told then I was not his problem, my friend was not his problem, and that he was running a business and so must stick to his policy. I asked if i could complain somewhere about this policy. He told me to go to the police if I had a complaint. There was absolutely no regard for customer satisfaction. I am never going back there again. The food was good, steamed pak choi excellent, portions generous. It's mostly spicy but the spice level is graded 1, 2 or 3 and you can remove the chillies from the food if they are served on top. Steamed rice only. West End prices but the food was tasty, the service quick and they have nice non-alcoholic juices such as lychee and strawberry. 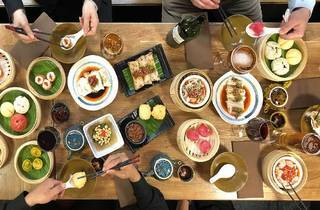 the food is spicy, but that's a good thing for a szechuan restaurant and it's easy to form an addiction to the menu. we came to ba shan when it first opened and were slightly disappointed. the menu back then featured some random dumplings (overpriced and teeny tiny) and some momofuku style pork buns (which we miss dearly). when barshu was closed, we came here for our fix and now can't stay away. 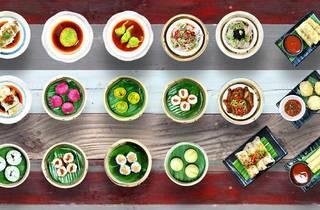 whilst it felt like they sold out when the shiny picture menus appeared, the food is still good and becomes even more authentically tasty when you look at the amount of oriental diners happily noshing next to you. 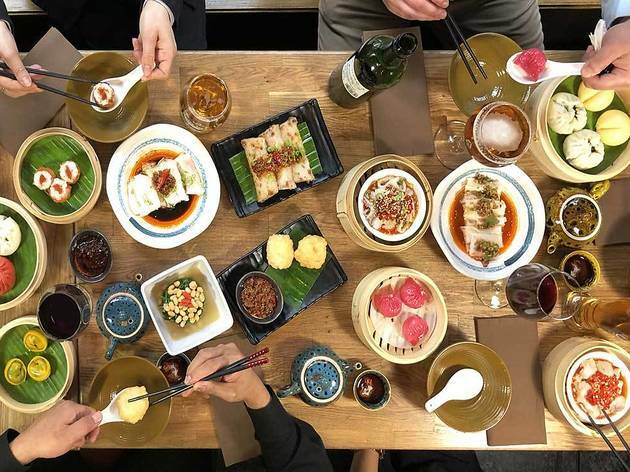 ba shan is best enjoyed with a small group of food loving friends with huge appetites so you can order all of the delicious starters, and still have room for the mains, of which the soupy beef thing and any of the beans are a sure bet. the ma po tofu was a bit disappointing - until you order the dish from any other restaurant and realise this is probably the best ma po tofu in town. service here is really touch and go. nine out of ten times the captain extends a cold greeting and waiting diners are made to feel like pests and hustled like cattle around the tiny foyer to the restaurant. this type of attitude is very irritating at a place with their price point. they also table turn, which is quite annoying if you forget when ordering and end up with too much food and not enough time to eat it. but most of the time the waiters and waitresses we've had are attentive and polite, which makes the dining experience bearable. so until a new place opens with the same caliber of food and better service opens in chinatown, ba shan will have to do. Just awful. Poor service with aggressive up-selling, made to feel very unwelcome with limited table time, too many offal dishes sold at premium cut prices, £9 for cabbage in vinegar was laughable - Avoid!